Happy New Year everyone. These were the last two pieces I made in 2017 which were delivered on the 24th of December. The penultimate piece for 2017 was an engagement ring finished just in time for Christmas. The diamond is a .90 carat, F colour and Vs2 clarity Asscher cut. Every detail of this classic lined solitaire ring was selected by the customer during the digital design process. The very last piece for 2017 was a remodel of a necklace into a ring. The necklace we were remodelling was also a remodel of a ring created by someone else that the customer has never liked. The most important part of the piece being the main diamond which belonged to her late grandmother. The design is low profile to suit here work as a nurse. 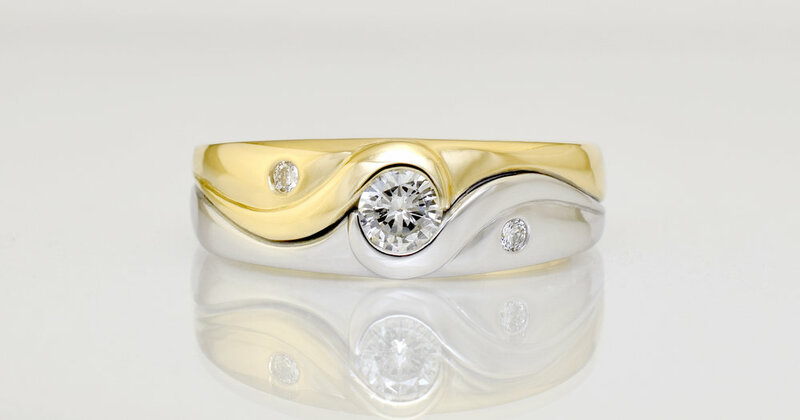 The ring was made in 18ct yellow and Palladium white gold. I hope that 2018 is a wonderful year for you all and thank you for your support during 2017.